Harbor master Charlie Blair, left, and assistant harbor master Will Schrade. Every year on the first of March, Edgartown harbor master Charlie Blair and his staff would arrive at their tiny dockside office at 1 Morse street knowing it was going to be a tough day. Or week. Or weeks. On that date for more than two decades, Mr. Blair opened up summer mooring and slip reservations in the popular destination harbor. “For two weeks straight, the phone wouldn’t stop ringing,” said assistant Will Schrade. The phone calls were just the beginning of a cumbersome process of entering the information into a spreadsheet, confirming by U.S. mail, and then dealing with cancellations and changes throughout the season. “It took us two days to make a reservation,” said Mr. Blair. This year was different. The crew showed up early as usual, but the whole process was automated with an online application called Dockwa. Mr. Blair raves about the new application and says customers do too. “I’ve hunted for 22 years for a reservation system,” he said. He started out with a huge chalkboard where reservations were hand written. An assistant who was handy with computers jury-rigged a spreadsheet system to handle reservations, which worked pretty well, but was still labor intensive. He even tried to adapt a hotel reservation system. That proved less than ideal. Last year Mr. Blair decided to hire someone to create a more efficient reservation system. He figured it would cost $30,000 to $40,000. He was preparing to draft a request for proposals so he could put the project out to bid, as required under state law. He heard about some whiz kids in Newport who had come up with an application. He traveled to their offices, with the intention of getting some specifications to include in his bidding process. He came away with the Dockwa software at no cost, in exchange for testing and working with developers to iron out technical bugs. At the time, Dockwa had only one customer. This summer Edgartown fully implemented the reservation system, along with more than 300 marinas up and down the East Coast, according to Mr. Blair. It’s also a good deal for recreational boaters. 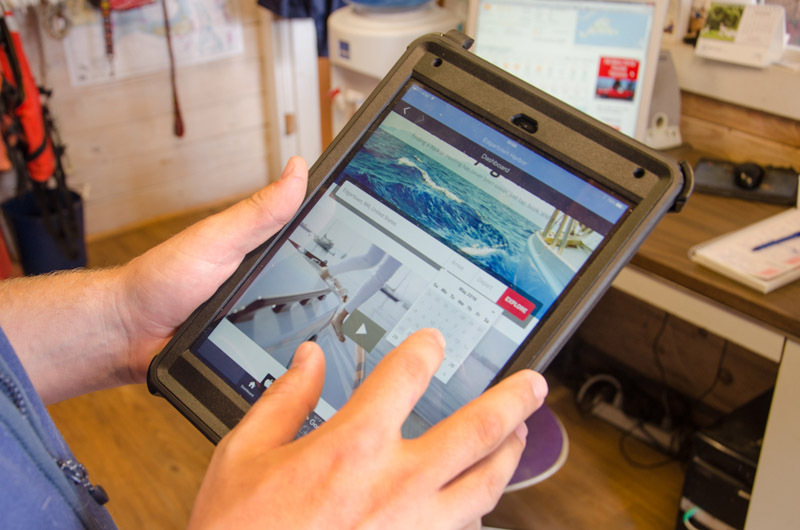 Boaters create an account with information about their vessel, including the size. Then it’s a matter of choosing a destination from a desktop computer, tablet or mobile phone. Boaters are presented with a calendar that shows open dates, pricing and payment information. Nearby harbors are shown, in case the preferred destination is sold out. Reservation changes are handled automatically. If a boater cancels a reservation through the online application, that mooring or slip instantly shows up as open again for other boaters looking to book a reservation, and is usually snapped up quickly, without the harbor master lifting a finger. Or a phone. The system has a few drawbacks. Mr. Blair said some boaters, when faced with sold-out accommodations for 45-foot boats, saw open moorings for 35-foot boats and simply changed their online profile to show they owned a 35-foot vessel. So what happens when the boater in question arrives on a busy summer day? “He gets a big strike against him, and he gets a strike with Dockwa, then you cannot use their system anywhere on the East Coast,” Mr. Blair said. There are other advantages. Mr. Blair said Dockwa handles all financial transactions and is able to get a much better rate on credit card fees than he got before. And the system produces paperwork in exactly the form needed by the town accountant and treasurer to record revenue from the harbor. The company also provides a professionally-designed website which offers information about the harbor and nearby businesses. Mr. Blair said it is a big improvement over the previous site. “It looked like Fred Flintstone did it, and guess what, I was Fred Flintstone,” the genial harbor master said. Harbor staff no longer take reservations over the phone, and that has left a few longtime customers grumbling. Some say they don’t have, or don’t know how to use, a computer. The staff has adopted a humorous approach to those customers. “You need to call your grandchild,” staffer Shelly O’Neil tells them. “Go down to the elementary school, get a third grader,” Mr. Blair says. Could not happen to a nicer harbormaster! I got a good chuckle about the third grader. It would not be so funny if it were not true! Charlie always hires the best people! Two of our children worked on the water at the Harbormasters office and one is currently employed for this summer. A great experience to work with a very talented team. They are there when you need them. Good luck to all of you this summer, and thank you. "jury-rigged a spreadsheet system"?! I'll have you know that was a glorious hacked together Access database, thank you very much. 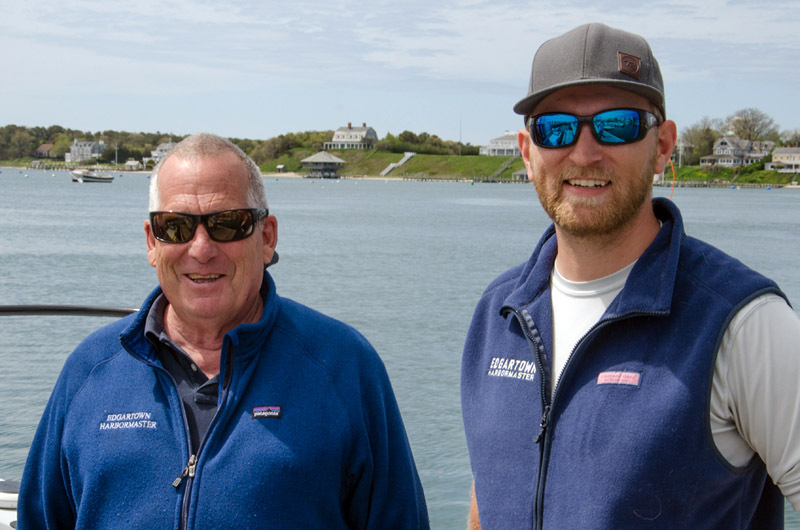 No surprise that the Edgartown Harbormaster was the first on the East Coast with this system which is a big win for boaters and the Town. Year after year it's such a pleasure working with the team. 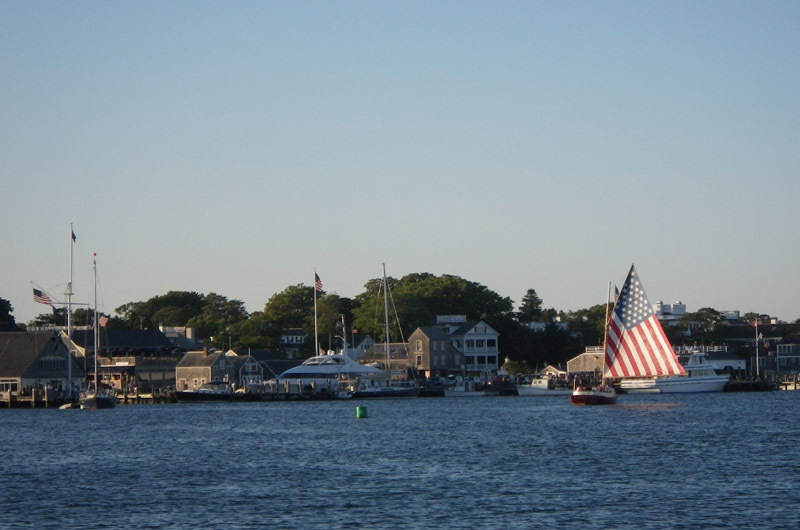 Edgartown harbor is a jewel, beautiful and with such great service it attracts boaters and visitors worldwide. The positive financial impact on the Town, businesses and real estate values is very significant. It is so refreshing to see a government functioning so well!